Sorry for the absence! It’s crazy here right now with impending deadlines and a million (well, two hundred) cupcakes to make for Alicia and Jason’s wedding next weekend. I’ve been trying to make some room in my freezer so I’ve mostly been eating a lot of curry out of the freezer. But gear up for lots of cupcake pictures. AND I’ll be taking part in “Veganmofo,” or The Vegan Month of Food, set up by Isa over at the Post Punk Kitchen. A bunch of vegan blogs, including this one, are going to post as often as possible about all things vegan-food-related for the month of October. 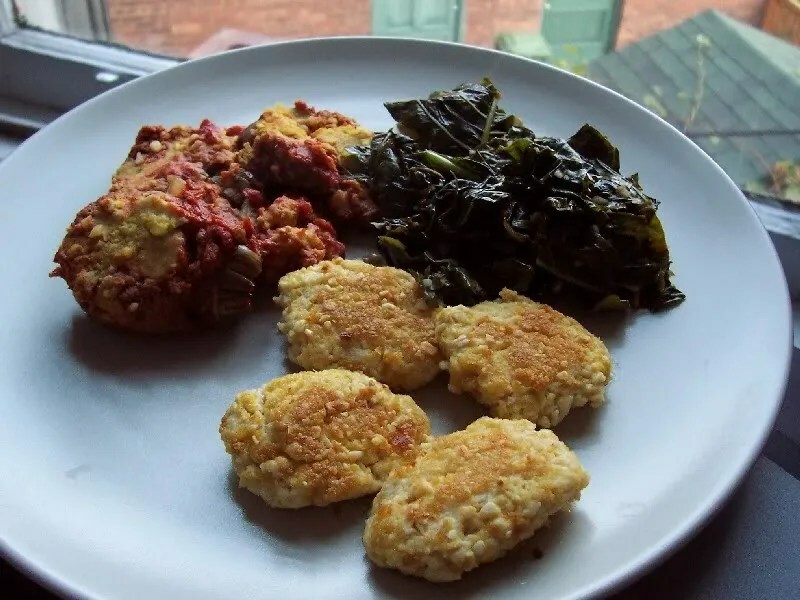 Okay, so this was frozen-thawed-silken-tofu nuggets crusted in the “parmesan” I made for the eggplant parmezano, leftovers of which are also pictured, and some sauteed callaloo. Delicious! woa…200 cupcakes?!!! thats some feat!